An ingrown toenail, or onychocryptosis, occurs when an edge of the nail starts to grow into the side of the nail sulci. An ingrown toenail is a common form of nail disease. It is an often painful condition in which the nail grows so that it cuts into one or both sides of the nail bed. For anyone who has suffered with an ingrown toenail, you know how annoying an injury they can be. It also does not help that we heavily rely on our toes as part of our everyday movement so we find that we are constantly aggravating the nail in the most innocuous ways. Ingrown toenails can become very painful, inflamed, and commonly infected. 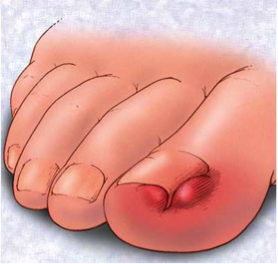 If treated early enough, ingrown toenail often don’t require surgical removal. However, deep ingrown toenails, or re-current ingrown toenails may be better managed long term with surgical removal under a local anaesthetic. Some ingrown toenails can be recurrent, even with professional treatment. When a toenail continues to cause problems for the person, sometimes a simple toenail procedure is required to cut away the part of the nail which is causing the ingrown nail to occur. In more serious circumstances toenail surgery may be required to be performed. In order to determine the best course of action we recommend booking an appointment with one of our trained podiatrists to find out how to best treat your ingrown toenail.